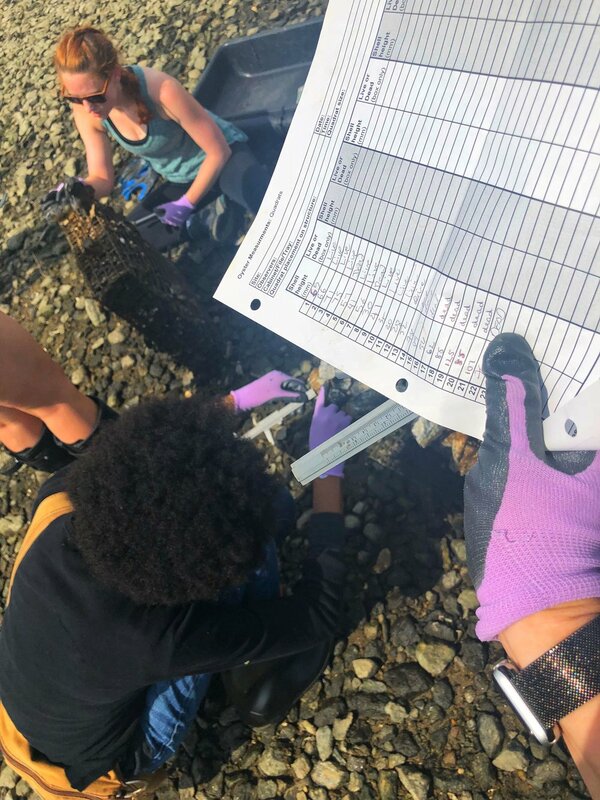 Here are the top 4 shocking things I have learned while volunteering with the New York parks department and the Billion Oyster Project (BOP). 1: Oysters are amazing little cleaners! Many don't know that NYC was once home to almost half of the world's oyster population. A single oyster can filter almost 50 gallons of water a day. Thats where BOP comes in. With the the help of the Harbor school, partnering restaurants, and volunteers (like me!) 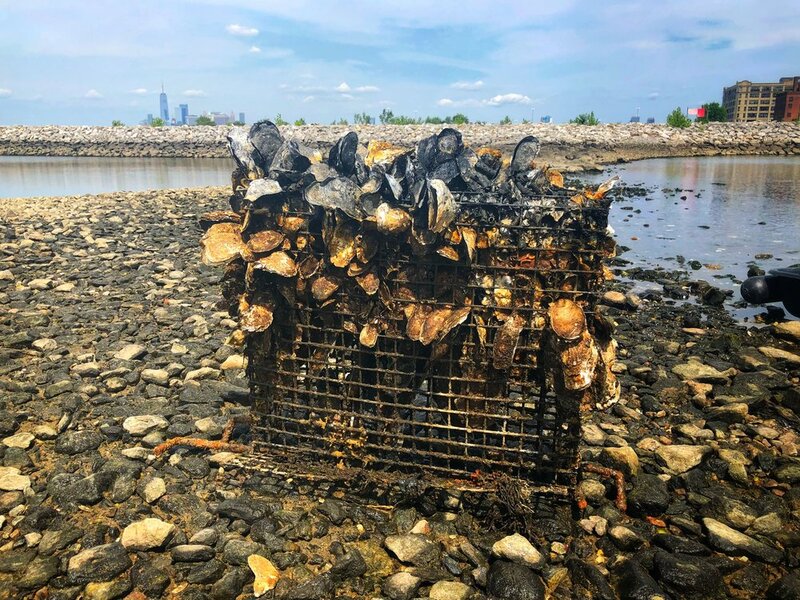 BOP is working to build the oyster reefs back up in New York harbor. These oysters are not for eating though, the NYC water is just too polluted for that. The main purpose of this project is cleaning that water. The plan is to add 1 billion Oysters to the water by 2035. A 2 year old cage of oysters grown in the lagoon. Working on building cages in an old house on Governors Island in 2017. Setting up goose netting so that they don't eat the young sea grass. Post pounder used for setting up the goose fencing. 2: Tree beds can help less garbage end up in the river! While volunteering with NYC Parks last summer our guide Leslie gave us a ton of information but the biggest thing was why tree bed maintenance is so important. The water system in NYC is great but cant handle an influx of water on very rainy days, and NYC gets a lot of flood warning days! On these super rainy days if the water treatment system cant handle the water volume it unfortunately they just dump the excess (untreated water) into the river. This is how a lot of the garbage you see in the river gets there. The tree beds serve a few purposes the most important of which is it can absorb water when it rains therefore decrease the probability that the water treatment plant will be overloaded. The beds need constant maintenance because they are walked on a ton and can be filled with trash. The soil becomes very very compact, like concrete, to where no water can penetrate. During my time volunteering we broke up the compacted soil, cleaned up trash and added fresh soil. I loved how people in the community would stop and thank us for the work we were doing. Its so nice that they appreciate their tree beds looking and functioning their best. Tools requried for tree bed maintance. 3: So many tampon applicators! One of the most shocking things I see every time I volunteer is the about of trash in our waterways. Despite how it got there we all have some level of responsibility to help reduce the amount of garbage we create because we really don't control where it could end up. In the park I worked in this past weekend there was a lot of caps, straws, little drug baggies, needles, and a massive quantity of tampon applicators. The tampon applicators infuriated me the most just because it is not only an item that never gets recycled (because, well, thats kinda tricky) but its also an item that you really don't need to use. This is entering TMI but I have been using a Diva cup for almost 3 years now which is completely re-usable and can be left in place for 12 hours at a time. I absolutely love this product and the freedom it has given me from tampons. And the best part is IT CREATES NO GARBAGE! Ok now that I got that off my chest, the main point I'm driving home here is that seeing tons of garbage has changed the way I see the products I use. I know its easy to think to yourself, "well thats not my garbage" or "thats not where my garbage ended up" but to be honest you just don't know. But even if you don't subscribe to that idea I think any reasonable person could be swayed just seeing the amount of garbage in the waterways. To me it is a wakeup call to change our habits. There are actually 2 in this photo, the blue object in the background is also an applicator. Leslie started a collection of the applicators we found in just a few minutes in the tiny space we were working in. 4: There will never be a block lined with just one type of tree! This one is a bit more nerdy but I think its so interesting. If you are ever in NYC you may notice that a tree lined street will never have the same species of tree all the way down the block. They intentionally very the species just in case there is a disease that starts to kill off a certain type of tree. Because the disease only spreads among the same species the disease cant spread far because the trees nearby it are not the same type. So smart! Also, if you are ever interested in tracking a tree's type and age in your neighborhood you can use the Tree Map website from the NYC Parks department. I just love what I get out of volunteering for nature causes and sharing what I learn with you. If you ever want to volunteer yourself check out the NYC Parks volunteer page and Billion Oyster's site for opportunities or check out whats available in your area. Filling up soil bags during a tree bed restoration project in 2017.